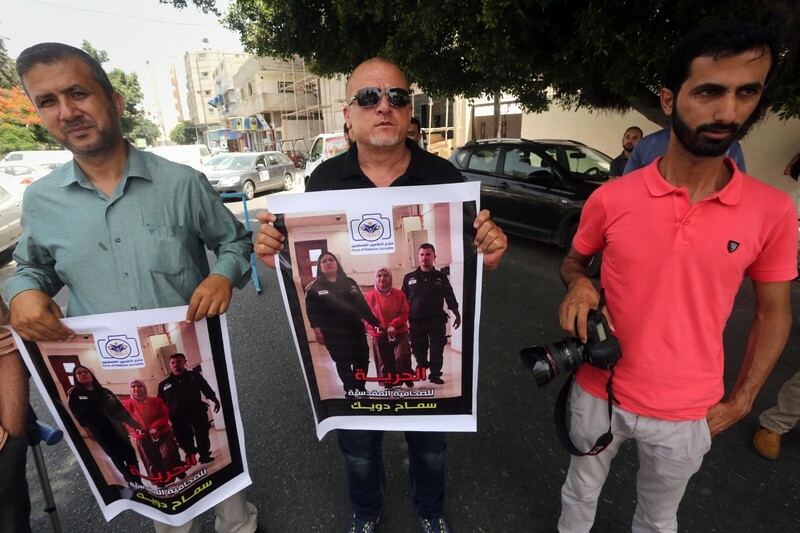 Palestinian journalists hold signs demanding freedom for detained colleague Samah Dweik, at a protest calling on Israel to release Palestinian prisoners, in Gaza City, on 5 June. The number of Palestinian journalists in Israeli prisons has risen to 21. This includes eight media workers arrested since the start of this year, prisoners rights group Addameer said on Monday. Among them are Addameer’s own media coordinator Hassan Safadi and Omar Nazzal, a member of the general secretariat of the Palestinian Journalists’ Syndicate. Safadi was detained in May as he returned from an international conference in Tunisia, while Nazzal was detained in April as he was en route to a meeting of the European Federation of Journalists. Both are among more than 700 persons in administrative detention, Israel’s British-colonial-era practice of imprisoning Palestinians indefinitely without charge or trial. According to Addameer, the detained journalists are from a range of backgrounds and outlets. They also include Al-Quds University media studies students Amir Abu Hleil and Muhammad Atta, and Birzeit University lecturer Nasser Khaseb. Among them too are Samah Dweik, who was one of the few journalists closely following the case of Palestinian schoolgirl Marah Bakir, imprisoned for allegedly stabbing an Israeli soldier. Dweik, held in a prison where Israel has traditionally kept female political prisoners, is accused of “incitement,” a charge Israel frequently levels against Palestinian journalists and social media users. In addition to Addameer’s own media coordinator, Israel has also jailed, since 2011, Salah Addin Awwad, the director of media for the Palestinian Prisoners Club. In March, Israeli occupation forces launched a harsher crackdown on Palestinian journalists, after the government blamed media for inciting the upsurge in confrontations between Israeli occupation forces and Palestinians that began last October. Israeli forces have physically assaulted and pepper sprayed journalists documenting their actions, abuses that have sometimes been captured on video. An Israeli raid that shut down the Palestine Today TV station in Ramallah in March prompted sharp condemnation from the International Federation of Journalists. “We cannot tolerate these continuous attacks from Israeli authorities to muzzle Palestinian press,” the group’s president Jim Boumelha said. Earlier this month, the Palestinian Journalists’ Syndicate appealed to the Newseum not to host Avital Leibovich, the Israeli military officer and spokesperson involved in the intentional killings of Palestinian journalists. But the Washington, DC, institution that purports to uphold media freedoms rejected that call for solidarity, prompting protests and interruptions during Leibovich’s presentation. This entry was posted in Palestinian Labor, Political Prisoners. Bookmark the permalink.